We accept yard waste for recycling. While we work with the NH DES on drafting food waste composting regulations, drop off of compostable household kitchen waste is free. 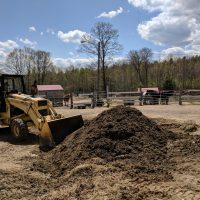 We ask for a $5 donation to the farm for each residential load of material delivered. Our Frequent-Flyer program is great for landscapers and contractors.